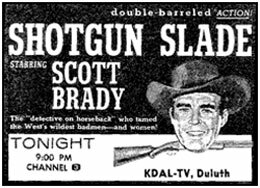 Do You Remember... "Shotgun Slade"
A double-barreled shotgun blast point blank at the viewer marked the opening to the syndicated “Shotgun Slade” starring Scott Brady as sort of an old west Peter Gunn. To the accompaniment of Gerald Fried’s jazzy score, Slade was a Denver, CO, based detective on horseback who hired out his services to the government, Wells Fargo, insurance companies and private individuals. Slade (no first name ever mentioned) carried a specially designed double-barreled shotgun instead of a six-gun. The lower barrel fired a 12 gauge shotgun shell, while the upper one discharged a .32 caliber rifle bullet. 79 syndicated half-hour episodes aired over two seasons, beginning in October ‘59 and ending by June ‘61. Produced by Universal’s TV arm, Revue, at a time when network censors were getting antsy about too much violence, “Shotgun Slade” crammed as much rough action into its 26 minutes as possible. But even Revue condescended and toned down at least the wild opening on the second season, simply having Slade come down an outside stairway and mount his horse. Gone was the in-your-face shotgun blast. Series creator Frank Gruber and producer Nat Holt certainly knew how to make an entertaining western long before either came to TV. Holt began producing westerns in the mid-late ‘40s with Randolph Scott (“Badman’s Territory”, “Trail Street”, “Return of the Badmen”, “Canadian Pacific”) before teaming with Gruber on “Fighting Man of the Plains” in ‘49. Earlier Gruber wrote “The Kansan” (Richard Dix) and “Oregon Trail” (Sunset Carson). Together they wrote/produced eight more terrific big screen westerns—“Cariboo Trail”, “Great Missouri Raid”, “Flaming Feather”, “Silver City”, “Warpath”, “Denver and Rio Grande”, “Pony Express”, “Rage At Dawn”—through 1955. They designed Slade not only as a man of swift action, but also as a ladies’ man (again, patterned after Peter Gunn?) to give the series plenty of feminine pulchritude with guest stars like Lisa Gaye, Ruta Lee, Claudia Barrett, Marie Windsor, Ann Robinson, Connie Hines, Nan Leslie, Kathie Browne, Donna Martell, Jane Nigh, Yvette Vickers, Mari Blanchard, Diane Foster, even Jacqueline Holt, producer Nat Holt’s actress daughter. The best of TV’s badmen guested on “Slade” as well: Roy Barcroft, Gregory Walcott, Lee Van Cleef, Gregg Palmer, Jack Lambert, George Keymas, Ted De Corsia, James Griffith, Chris Alcaide, Myron Healey, H. M. Wynant, among others. 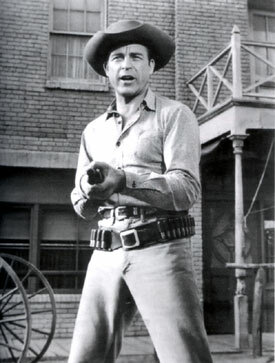 Additionally, producer Holt did what is regarded as “stunting”, with special guest stars brought in that were not normally seen on TV westerns. These included former B-western stars Jimmy Wakely, Tex Ritter and Don Barry; sports stars—football player Elroy “Crazy Legs” Hirsch, boxer Lou Nova, baseball player Sandy Koufax; comedian Ernie Kovacs; flying ace “Pappy” Boyington; country singer Johnny Cash; and silent actor Francis X. Bushman. Filmed mostly on the Universal backlot, director Sydney Pollack (“Way We Were”, “Jeremiah Johnson” etc.) cut his directorial teeth on “Slade” and other series at this time. Star Scott Brady (1924-1985) was the younger brother (by 5 years) of Lawrence Tierney who was already making a name for himself in Hollywood by the time Brooklyn born Brady came west after service in the Navy during WWII. Brady’s first screen role was in his brother’s “Born to Kill” after which he soon signed with Universal-International. Like Gruber and Holt, by time for “Slade” he also knew his way around the western backlot, having been in “Kansas Raiders”, “Montana Belle”, “Johnny Guitar”, “Law Vs. Billy the Kid”, “Maverick Queen”, “Storm Rider” and others. 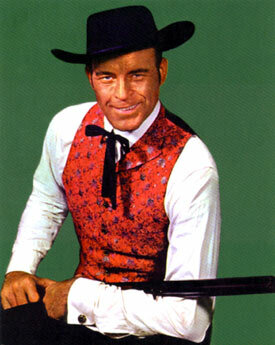 “Shotgun Slade” never reached the top ratings ranks of “Rawhide”, “Gunsmoke” etc. but provided solid western excitement to TV viewers.